Chasidy is using Smore newsletters to spread the word online. A cold front is when a cool air mass is replacing a warm air mass. The air behind a cold front is usually colder and dryer than the air in front of it. This front usually causes cumulus clouds to form. Before a cold front passes there is a short period of showers. While a cold front is passing it usually produces heavy rains, sometimes with hail, and thunder and lightning. And after a cold front passes there is still showers but then starts clearing. 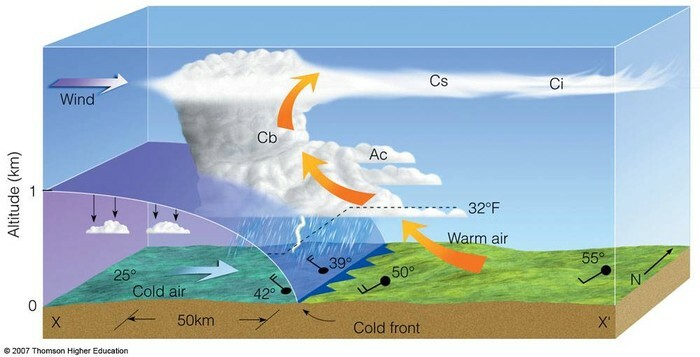 A warm front is when a warm air mass is replacing a cold air mass. Air behind a warm front I usually warm and more moist than the air in front of it. A warm front usually causes nimbostratus clouds to form. And before a warm front passes the weather is usually light rain, now, sleet, or drizzle. And while a warm front is passing there is most likely drizzle or no precipitation at all. And after a warm front passes there is usually no precipitation, and if there is it's light rain or showers. A stationary front is what a cold and air mass meet and neither one has enough strength to replace one another. A stationary front usually creates fog and clouds. It may bring many days of rain or snow. 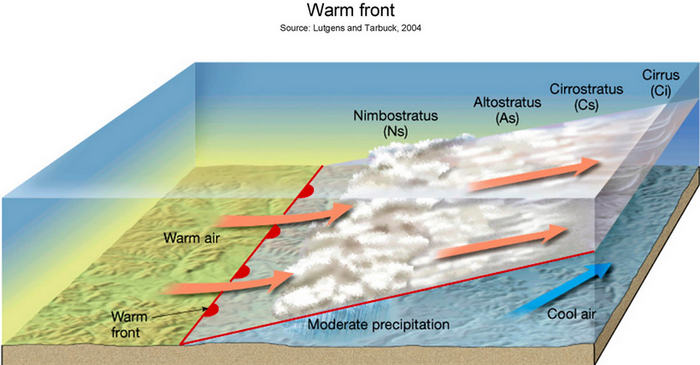 Occluded fronts are formed during a process called cyclogenesis, where a cold front over takes a warm front. 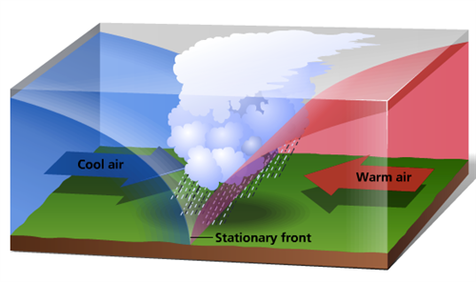 An Occluded front usually brings light, moderate, or heavy continuous rain.